We were tasked with making a sleepover bunk room for our clients’ two boys in the bonus room over a three car garage. The center ceiling tray slopes to low knee walls along the length of the space. Immediately we envisioned a tented bunk house, YMCA camp style. The arched opening of the living room directly faces the arched opening of the family’s media room across a wide hallway. It was important for us to create a color palette that was distinct in each but also analogous because of the open sight lines between the two rooms. We opted for a warm neutral wall color in each space and expressed the differences on the fifth wall: the ceilings. In the living room we papered the ceiling in a thickly textured, basket weave grass cloth. Brilliant shades of coral, lime, sunny yellow, plum, and turquoise accent fabrics contrast the otherwise neutral space. 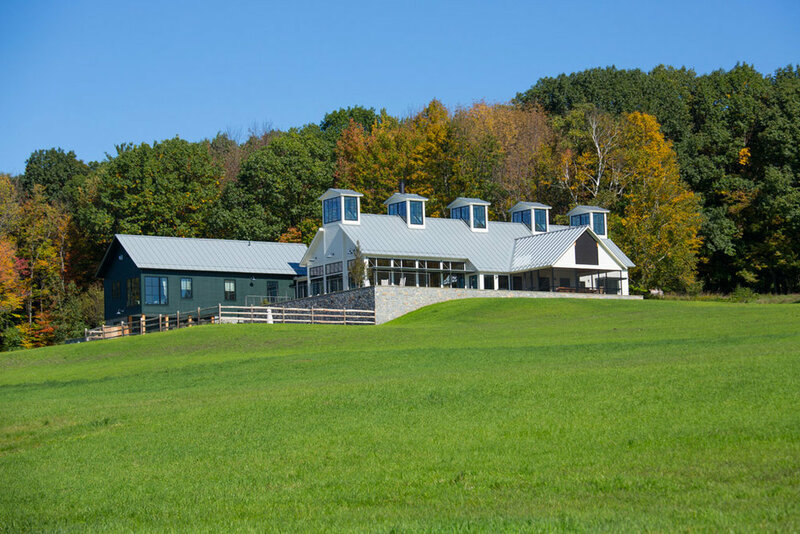 The architecture of our client’s home was designed to embrace a perfectly bucolic view of a Berkshire pond, meadows, and extensive gardens along a curve. At our first meeting, our client specifically asked us to bring femininity and softness into her living space; it was time to have her environment updated to reflect her present moment, and take her into the future. 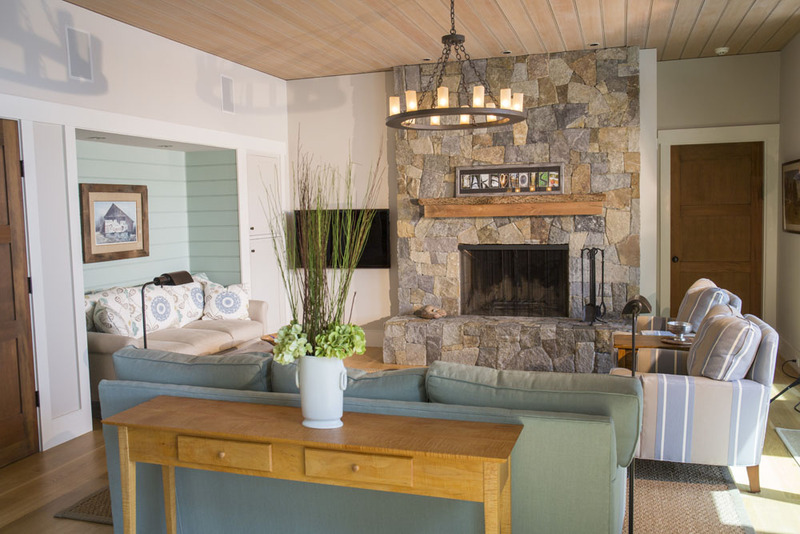 At her request, we focused on the living room, family room, and owner’s suite using a palette of her favorite things: colors from her garden, the sky, and water. We wanted the primary suite to be an oasis for our clients. The bedroom is woodsy and calm, with a bit of tongue and cheek humor on the theme. 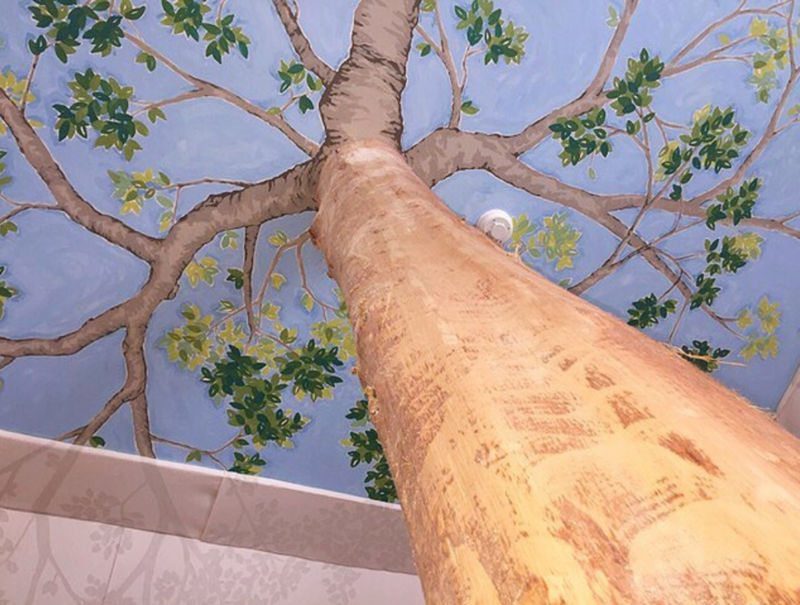 The ceiling features a wood grain, which is drawn and applied as wallpaper rather than a more traditional wood ceiling. Chairs face outwards towards the view for quiet reflection and meditation. The trees outside and neutral interior tones combine with with weathered teals to promote feelings of relaxation. Woven striped linen custom window treatments are accented with tie backs featuring trim made of twigs. Within a small courtyard, a red plum plank door welcomes our clients, their adult children, and a large extended family. Inside the entry, Karen Beckwith Creative brought the outside in by featuring bare trees sporting golden pears. 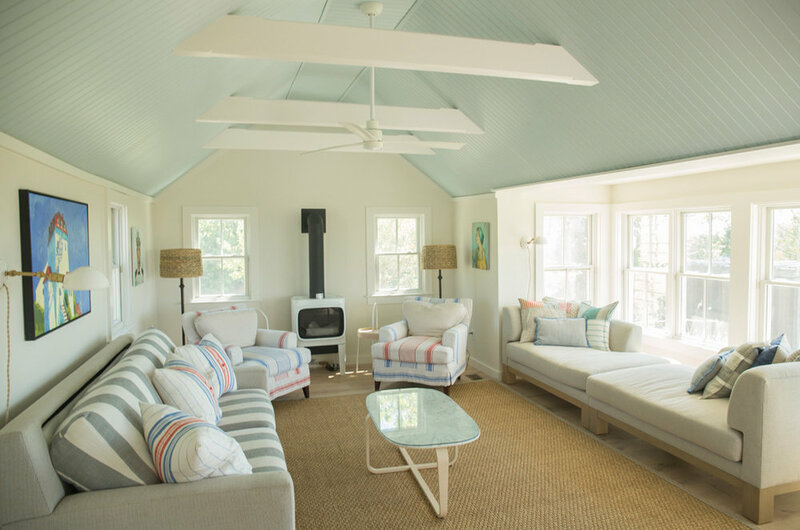 The plank shiplap ceiling we painted in a soft yellow green – the actual color of pears. The upstairs loft suite was renovated into a private sanctuary for the homeowner’s teenage son, which overlooks a gorgeous meadow and forest beyond. 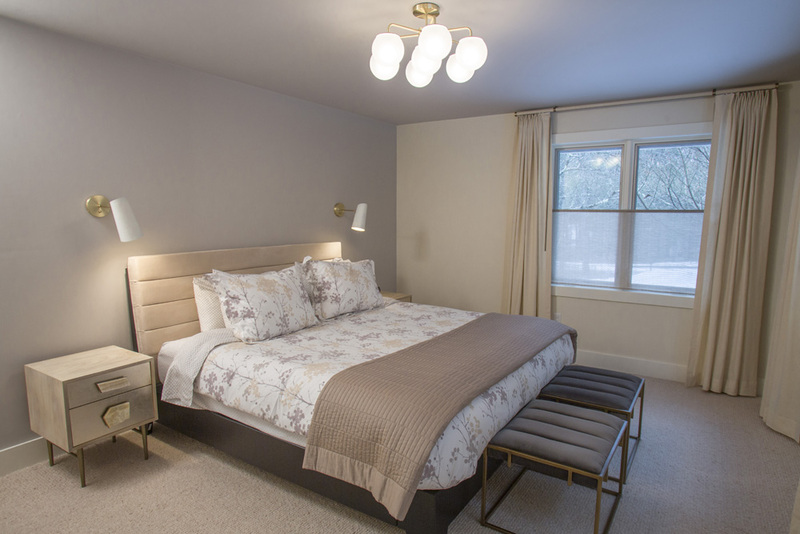 In it we have a study/guest suite, a private bath and a grownup bedroom furnished with lovely modern pieces. 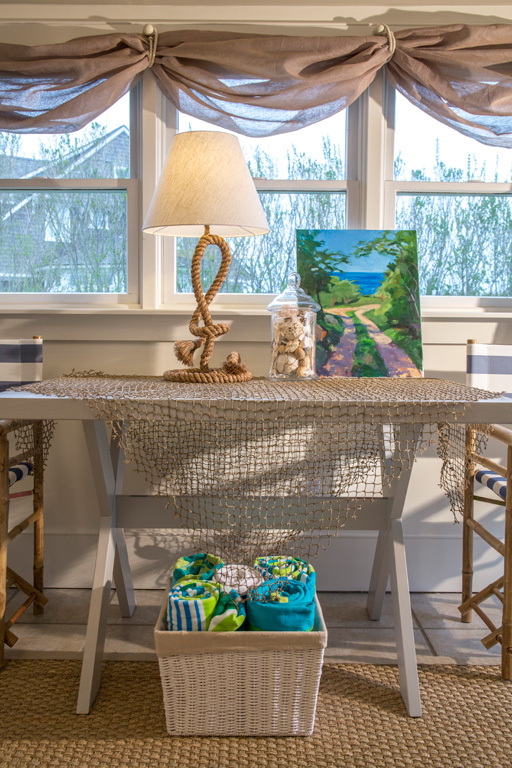 Our clients purchased a 80s modern Rhode Island beach cottage with long distance views to the sea from the second floor living space. The footprint of the house is small but they requested a living room that could accommodate up to 8 guests seated. We furnished with tight back custom frames covered in outdoor performance fabrics. 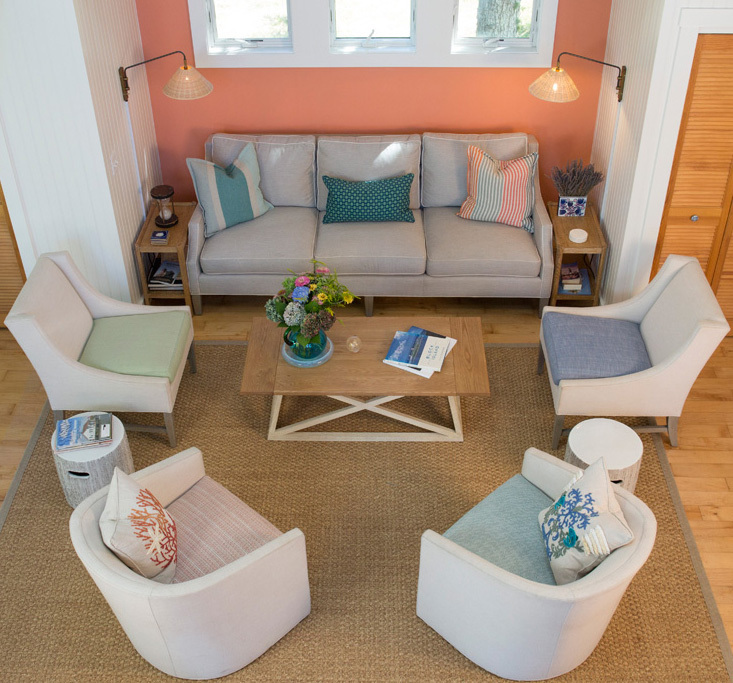 The resulting room is largely neutral – light oatmeal tones with colorful textures on the seat cushions of the club chairs and coordinating seaside crewel work pillows. All are accented with custom made Karen Beckwith Creative throw pillows. Our design directive was to make a crisp, clean yet classic lake cottage with practical hard-wearing materials. 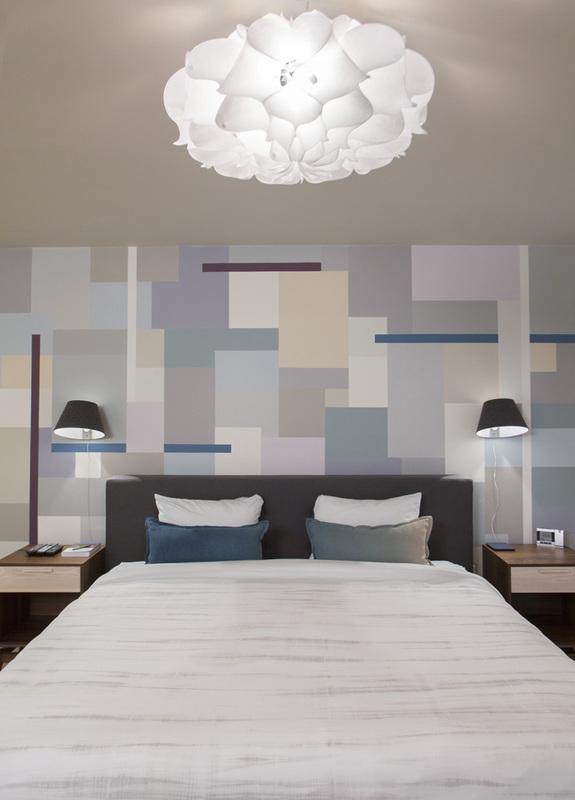 We kept the majority of the surfaces neutral and added color in places where we had wide beaded board accent walls. The result is a home that feels simultaneously vintage and contemporary. 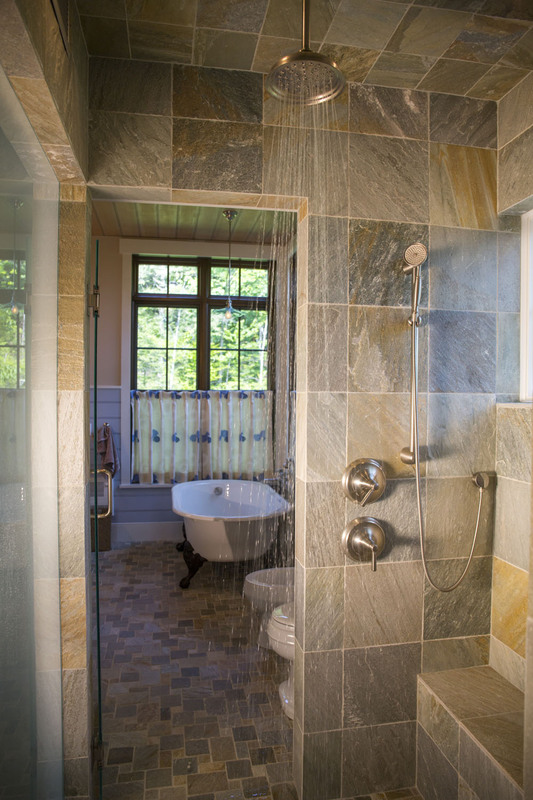 An outdoor shower in New England has an extremely short season so we endeavored to create the feeling of an outdoor shower indoors. 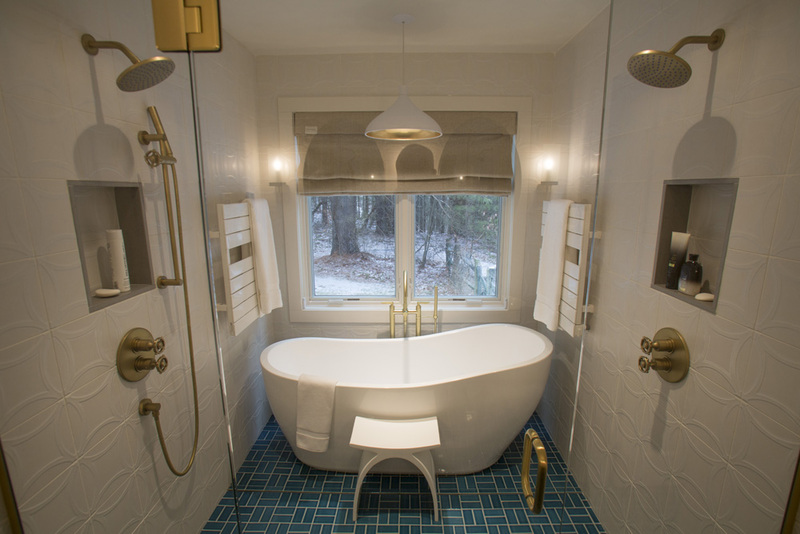 This master suite bath, architecture by David Potter, connects his and hers bathrooms at the walk through shower. During this renovation we wanted to keep everything that felt authentic about this Rhode Island 1880s farmer’s cottage. 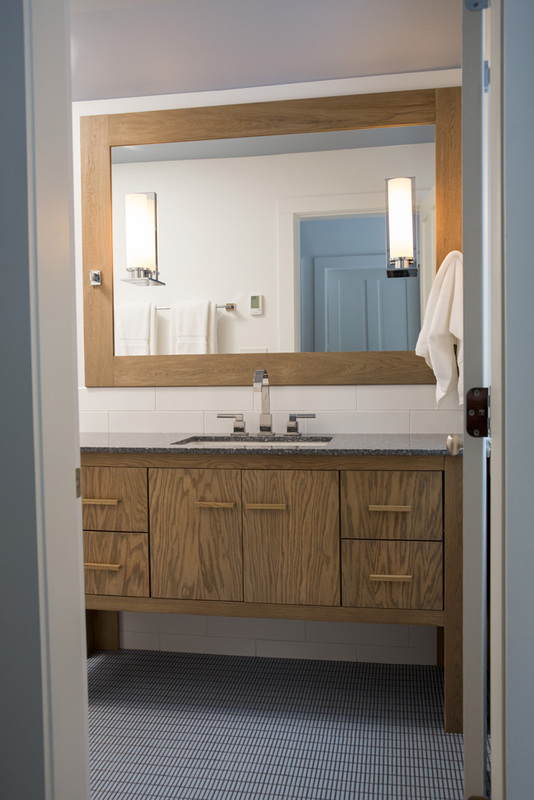 This third floor bathroom was created using found space that was hidden at the intersection of the old roof line and the new addition. This dreamy guest bedroom features soft cream and taupe. Sometimes the concept for a piece of art requires the larger scale of the walls themselves. Art that is applied directly to the walls creates an immersive experience that only scale can provide. Karen Beckwith Creative often collaborates on modern designs for ‘art on walls’ with muralist Ardis Barrow of Art & Atmosphere. 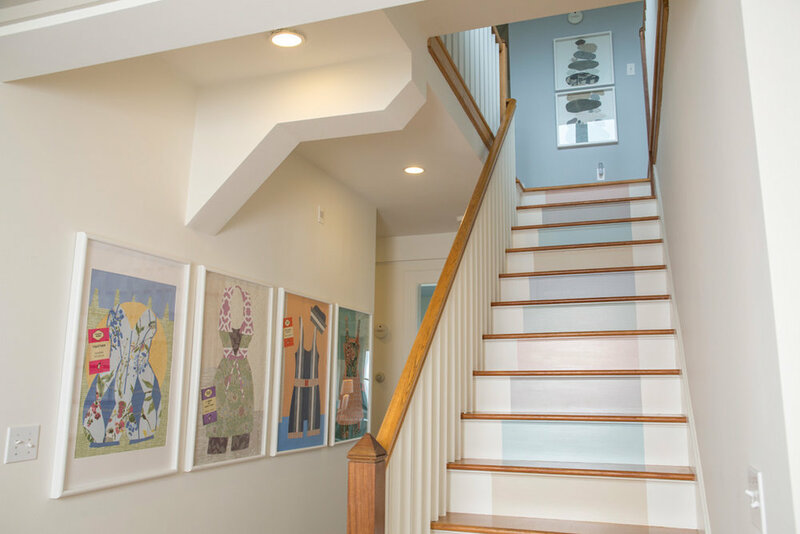 Color leads the way to the dramatic living room and bedrooms on the stair risers, pulling tints of coastal color from every room in the house. Pool house family space with kitchenette.